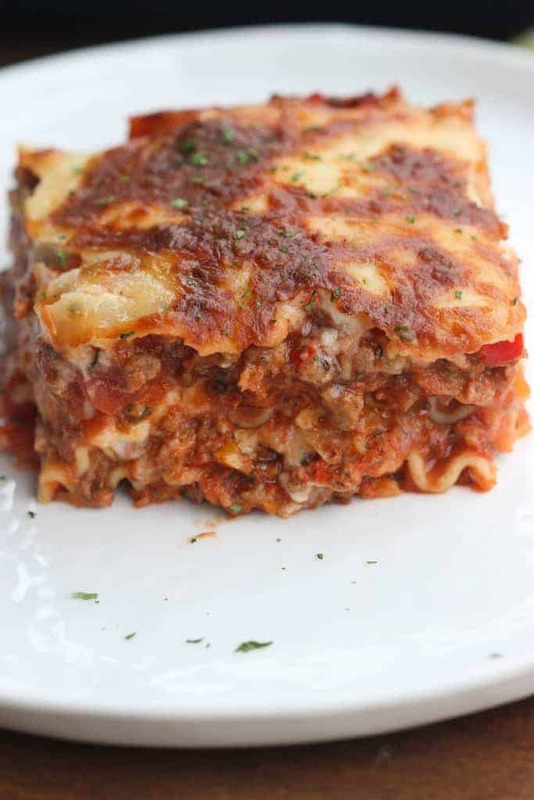 Step-by-step recipe and photos for making The BEST Lasagna ever! This classic Italian lasagna is authentic, made with bechamel white sauce (no ricotta) and a simple red sauce. 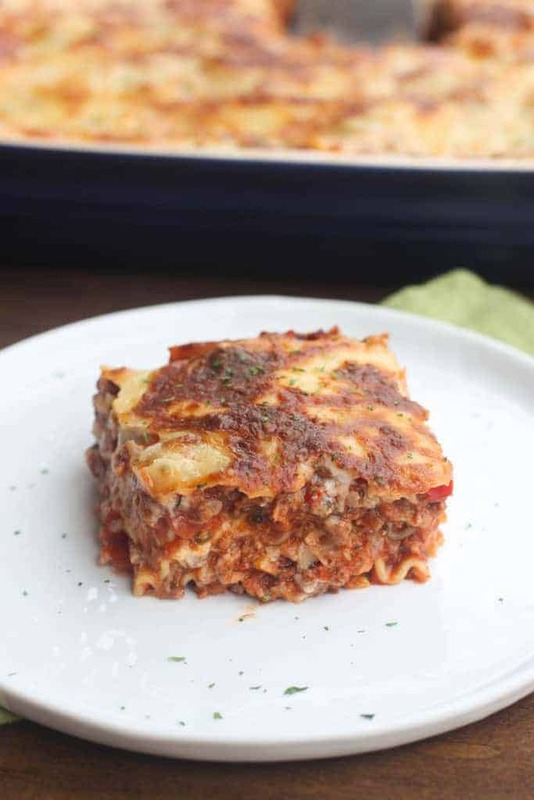 Lasagna is one of those recipes everyone has on file, but I’m urging you to toss your recipe aside and try this version! Saying this recipe is the BEST LASAGNA ever” is a bold claim, I know, but I’m confidant it’s the closest thing you’ll get to ordering straight from an Italian restaurant! I grew up in a “no cheese” household, meaning my Dad and brother don’t eat it, so my mom rarely cooked with cheese. We hardly ever had lasagna on the menu, but in the rare times it did happen, it was the BEST. If my mom was going to make lasagna, she didn’t cut corners. This recipe is completely authentic. There’s no cottage cheese, “cream of” soups, ricotta cheese or anything else you may find in other lasagna recipes. It starts with a homemade red sauce, using simple pantry ingredients. I also add pureed vegetables to the sauce to give it great flavor (and it allows you to sneak in some veggies to an otherwise cheese and carb-filled dish). The meat in the sauce is a combo of ground beef and Italian sausage. Once the meat is browned in a skillet I like to crumble it into extra small pieces in my food processor, before adding it to the sauce. This helps keep the sauce smooth and thick, without any overly large meat pieces. Disclaimer: I WILL admit, when I’ve been short on time I have substituted jarred pasta sauce from the store. Use 48 oz. of jarred pasta sauce in place of the red sauce, but add the cooked ground beef, Italian sausage and fresh chopped basil to it. The traditional béchamel sauce used for this lasagna is what really sets it apart! Béchamel is just a fancy name for a white sauce that is made with butter, flour and milk. The simplest ingredients that everyone has, and they come together to form a smooth, thick and creamy white sauce. Both of the sauces can be made in advance, for extra quick assembly the day you want to bake lasagna. If using regular noodles, cook them in a pot of boiling water for half the time suggested on the box. That way you don’t end up with overcooked noodles after your lasagna bakes. If you are making freezer lasagna you don’t need to cook the noodles at all! Drain noodles into a large colander and sprinkle them with a tiny bit of olive oil to keep them from sticking together. Have your shredded mozzarella cheese and parmesan cheese on hand, and you’re to assemble! First, lay three noddles in the bottom of your 9×13” pan. Next, cover the noodles with a layer of red sauce, followed by a layer of white sauce. Sprinkle a handful of shredded mozzarella and parmesan cheese on top. Repeat these layers 2 more times, using up all of the sauces and cheese. Bake until it’s hot and bubbly and the cheese is golden brown. You can make the white sauce and red sauce in advance. You could also boil the noodles in advance. If you want to assemble the lasagna before baking it, make it according to the directions, cover it with plastic wrap, and then tinfoil and refrigerate it for up to 2 days. 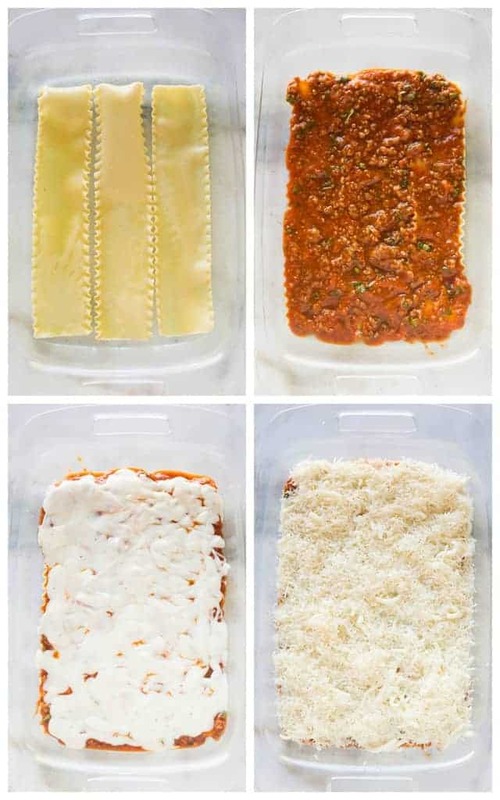 Assemble lasagna (use uncooked regular noodles or no bake noodles).. Cover really well with a layer of plastic wrap and then a double layer of aluminum foil and freeze for up to 2 months. Remove from freezer and allow to thaw in the fridge for 24 hours. Remove plastic wrap. Cover with tinfoil and bake until warmed through and bubbly. about 45 minutes. Remove tinfoil 15 minutes before it’s finished baking to allow cheese to get bubbly. Assemble and bake lasagna as instructed (using uncooked regular noodles or no-boil noodles). Allow to cool completely. Cover really well with a layer of plastic wrap and then a double layer of aluminum foil and freeze for up to 2 months. When ready to eat, you can thaw in the fridge for 24 hours, as stated above, or bake from frozen for 1 1/2 hours (still covered with foil, but remove plastic wrap.) Then uncover and bake for another 45 minutes or so, or until the lasagna is hot and bubbly. The BEST authentic lasagna recipe. Made with an easy homemade bechamel white sauce (no ricotta!) and red meat sauce. 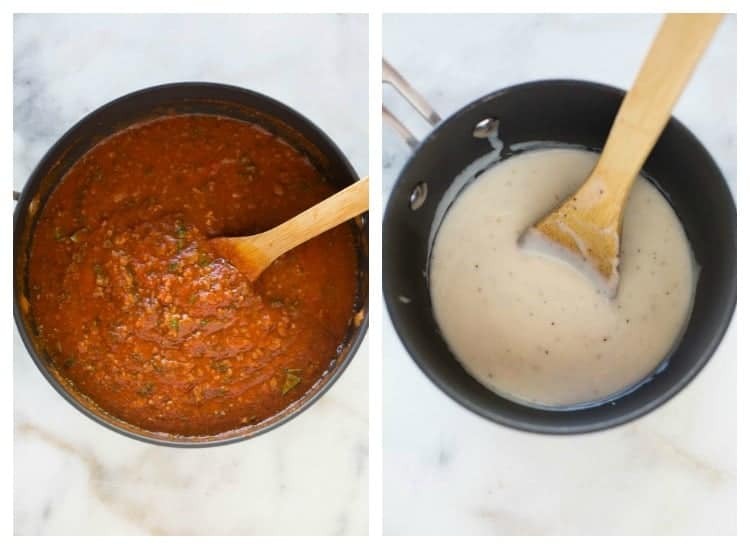 Make the Red Sauce: (Can be made in advance). In a large skillet, brown the ground beef and sausage over medium-high heat, breaking the meat apart into pieces with a wooden spoon. When cooked through, remove the grease. Add meat to a food processor and pulse just 3-4 times until it’s broken up into very small pieces. Remove to a bowl. In the same skillet over medium-high heat, add olive oil. When oil is hot, add the garlic, stirring constantly for 30 seconds. Add the onion, spinach and bell pepper. Continue cooking on medium-high heat until the vegetables are softened –about 2-3 minutes. Remove from heat and transfer them to the same food processor. Pulse several times until they’re nearly pureed. Return mixture to the skillet and add the tomato sauce and tomato paste and stir to combine. Add the diced tomatoes, Italian seasoning, and salt and pepper to taste. Stir. Cover and allow the sauce to simmer for about 20-30 minutes on low heat, stirring occasionally. Right before using the red sauce in the lasagna, stir in the reserved crumbled ground beef and sausage, and fresh basil. While the red sauce simmers boil the lasagna noodles for half the time suggested on the box. Drain into a large colander and sprinkle them with a tiny bit of olive oil to keep them from sticking together. (You can skip this step if you are using no-boil noodles). For the White Sauce: (Can be made in advance). Add the butter to a medium size saucepan or large skillet. Over medium heat. Once melted, add the flour, stirring constantly to combine 2 minutes. Gradually add in the milk, whisking until smooth. Season with salt and pepper. Cook over medium heat, whisking often so it doesn’t burn on the bottom, until it thickens-- about 5-7 minutes. Preheat the oven to 350 degrees. Lightly grease a 9X13-inch baking pan with cooking spray. Keep in mind that there will be 3 layers of lasagna, so mentally split the sauces into thirds as you layer them to make sure you have enough at the end). Start by layering the bottom of your greased pan with 3 lasagna noodles. Spread the red sauce over the noodles, followed by the white sauce, Parmesan and mozzarella cheeses, spreading all to the edges. Top with another layer of noodles, then red sauce, white sauce, parmesan and mozzarella cheeses. Add the final layer of noodles, then red sauce, white sauce and cheeses. Bake for 30 minutes. Allow the lasagna to sit for 15-20 minutes before serving. I love to serve this with homemade breadsticks! *If you want to use bottled pasta sauce, instead of making the red sauce from scratch, heat 48 oz pasta sauce in a large skillet. Add cooked and crumbled meat, and chopped basil. Instructions for making ahead and freezing are listed above in the post! I originally shared this recipe in February 2016. Last updated December 2017. This ended up being the most delicious lasagna I have ever eaten and the best dish I’ve ever prepared. I ended up making a little more of both sauces and I used all of what I made. I bought the best ingredients I could get my hands on. It’s just soo good, thank you very much for sharing this recipe!! I couldn’t ask for a better compliment–and, well done, I’m so glad it was a great success! Best lasagna my family has ever eaten! 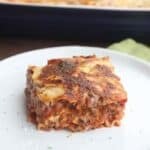 We are not big ricotta fans in this house (my husband LOATHES it) so I was excited to come across a lasagna recipe without ricotta and with such great reviews. I was a little apprehensive at first because of the bechamel–my mom makes it for one of her recipes and it was never a favorite. It turns out, I don’t think she makes it right (sorry Mom!) because the bechamel in this recipe adds an absolutely luxurious silkiness and pop of flavor that I never knew lasagna could have. And it takes no time to whip up the bechamel even if you’re pressed for time and cutting corners by using a premade tomato sauce. This recipe is brilliant and has absolutely become a staple. Thank you for sharing!